My train back from Cardiff yesterday ended up taking a curious diversionary route into Oxfordshire, with the HST ending up at Banbury station for 20 minutes before reversing out in the opposite direction. 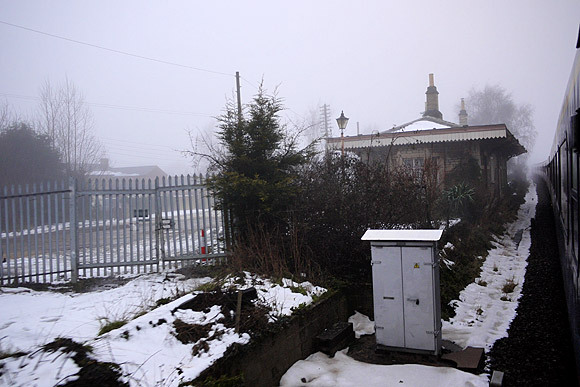 With the station shrouded in deep fog and the silence only sporadically broken by the sound of passing freight trains or the clunk of steam-era, mechanical semaphore signals, it really felt like we’d entered some kind of time warp. 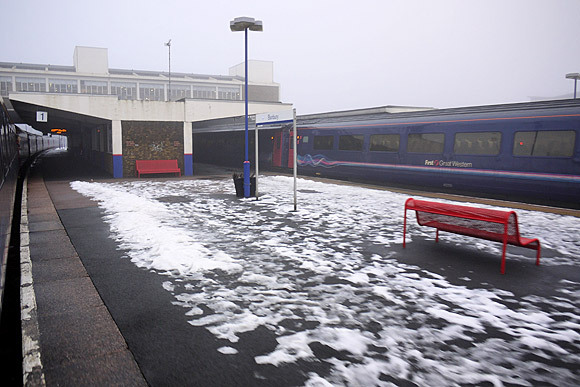 Not only did the station look like something from the 1930s, but there was an abundance of old school trainspotters scuttling around the snow covered platforms too, busily taking pictures, noting numbers and waving at departing trains. 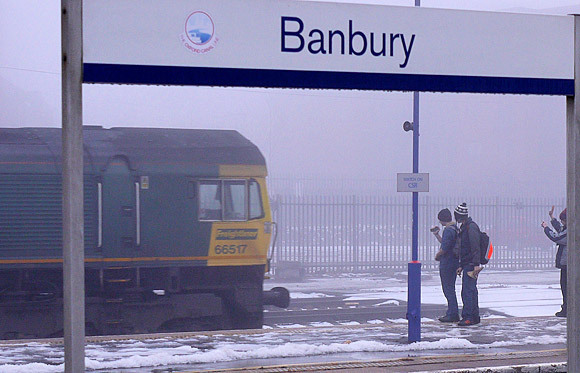 The original Banbury station (known as Banbury Bridge Street) opened in 1850 and sported a wooden overall roof which survived until 1953. 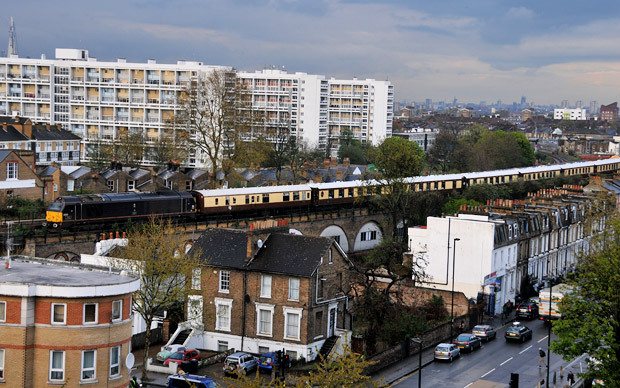 By that time its frailties had become near-legendary, with each passing express train threatening to send the wobbling beams crashing on to the rails below. 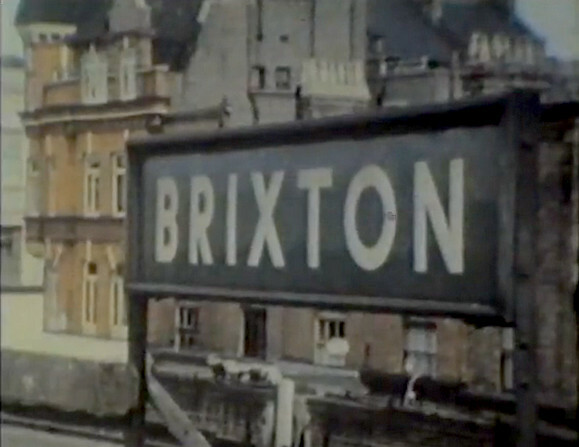 The entire station was finally rebuilt in 1958 by an architect clearly rather fond of concrete. 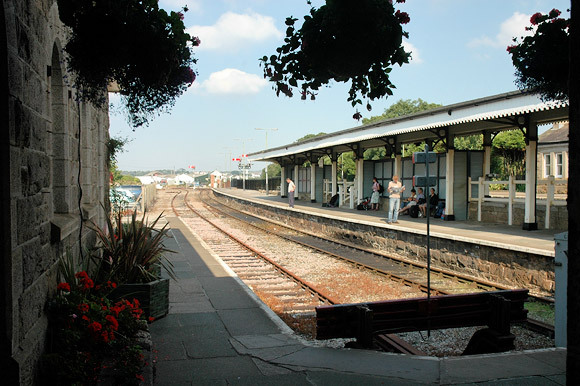 The station still retains an air of a pre-nationalisation station, with a selection of GWR-style lower quadrant semaphore signals, each still sporting a natty little finial on the top. 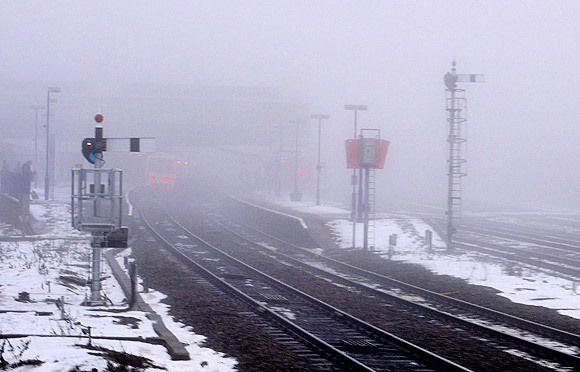 Photo taken out of the window of my train as we waited for the signal to change. 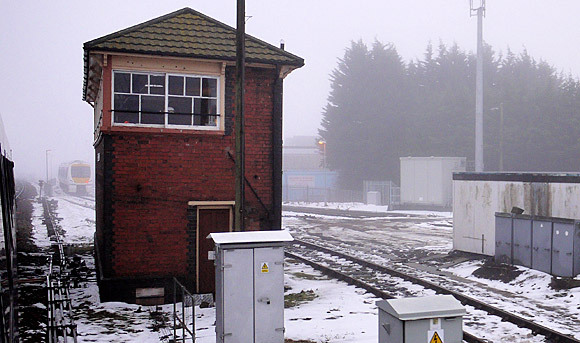 You can just make out the signal box to the far right. 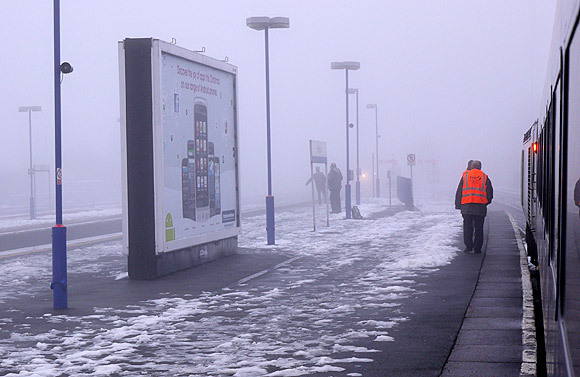 Rail staff and trainspotters wait for an inbound train to emerge from the fog at the end of the platform. 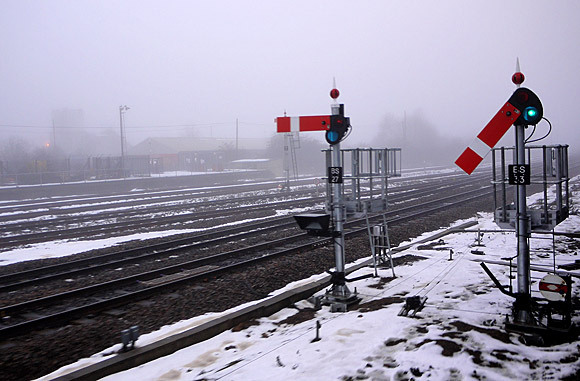 Three semaphore signals – all with finials! 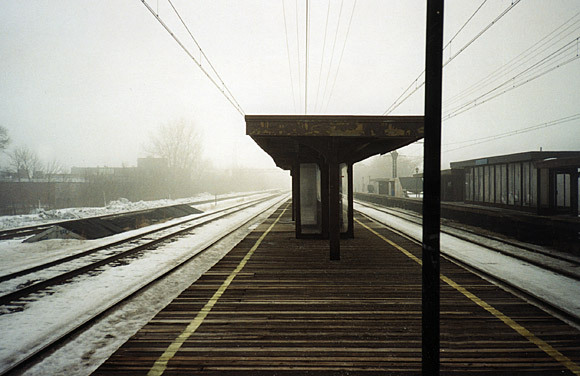 – guard the up line tracks. 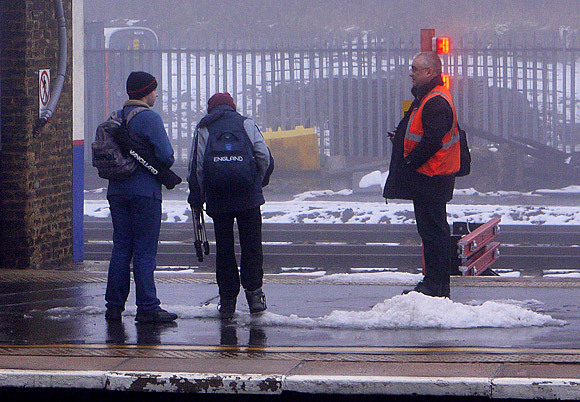 Tripod-toting trainspotters (try saying that after a few beers) chat to a member of the station staff. 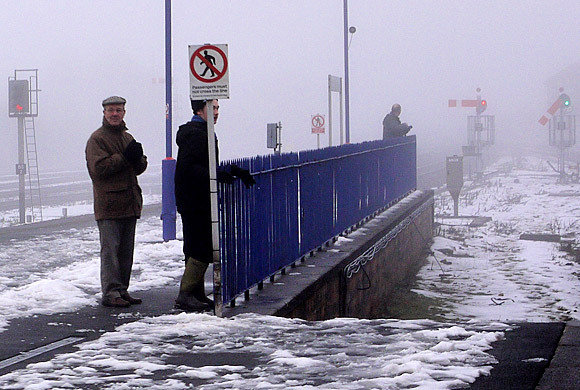 Rail enthusiasts at the end of the frozen platforms at Banbury. Nutters! 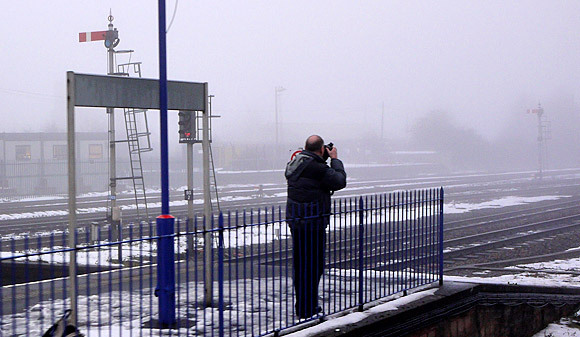 Snapping the action, Banbury station. 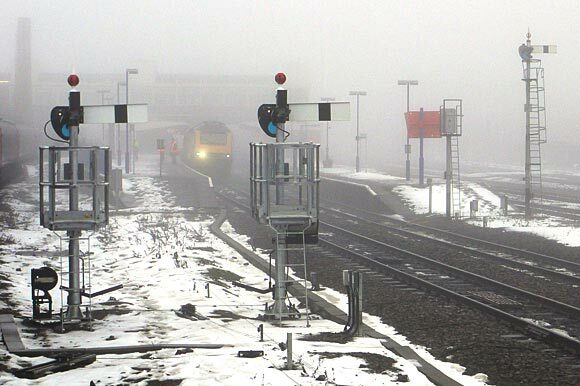 And we’re off, with the semaphore signal set to green. 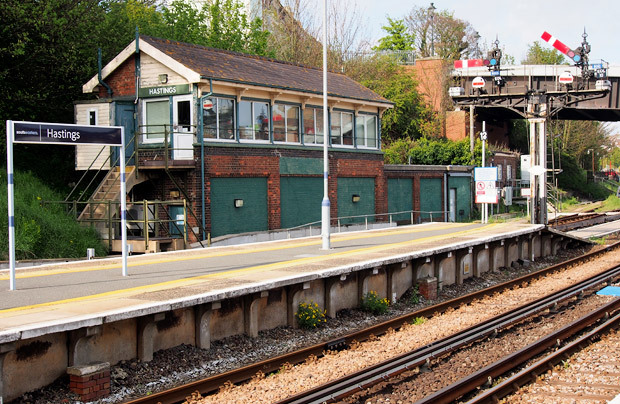 Passing the GWR Banbury signal box as our train heads on to London Paddington, in a journey that ended up taking nearly twice as long as usual because of the various rail works on the line. 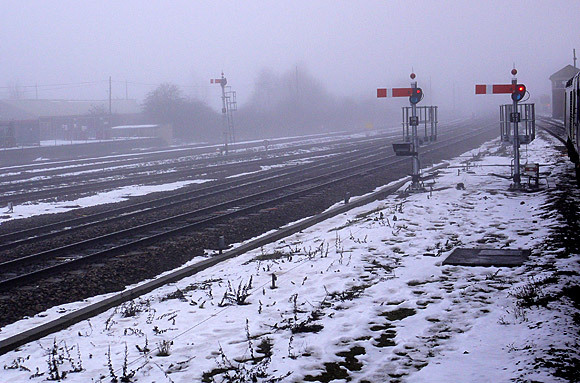 I didn’t really mind though as it was lovely to speed across snow covered landscapes in a warm carriage, supping hot coffee, surfing the web and relaxing after the boozy excesses of Christmas! 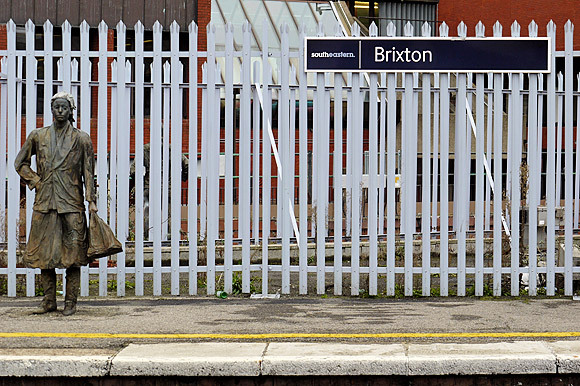 But what you doing taking all them pictues and banging on about semaphore signals, you “trainspotting nutter”? 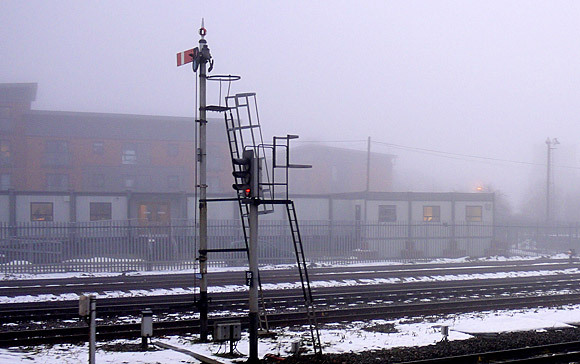 I can’t get enough of semaphore signals, mate. Love ’em!